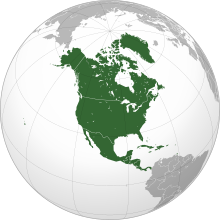 North America is a large continent in the Northern and Western Hemispheres of Earth. It is to the east of the Pacific Ocean, the west of the Atlantic Ocean, the south of the Arctic Ocean, and it is the northern part of the Americas. The southernmost part is Central America. It is the third largest continent in the world, after Asia and Africa. Hundreds of millions of years ago, North America was part of a larger ancient supercontinent named Laurasia. A few million years ago, a new land bridge arose and connected North America to South America. Beringia connected North America to Siberia a few times during ice ages in the past 20,000 years. North America has a population of 527 million and is the 4th most populous continent in the world. The countries south of Mexico as far as Panama, known as Central America, as well as the islands in the Caribbean Sea (known together as the Caribbean islands), are also considered part of North America. This page was last changed on 28 November 2018, at 23:49.